2. Max door weight: 40kg. 1. High quality aluminium-alloy door closer body. 2. High quality silver coating finished. 3. Door closer comply to EN 1154. 4. Fire-rated tested. CE approved for B-904. 5. Back Check ( BC) and Delay Action are optional. 7. With standard foldable arm.Parallel arm channel, hold-open arm are optional. 8. 2 closing speed adjustable. 9. 500000 times tested without damage.7 years WARRANTY. 10.Germany machine oil and sealed rings, keep perfect working in cold temperature. LASTING Hardware Door Control Manufacturing Co., Ltd. is the China factory of GERMANY LASTING HARDWARE( HK) INDUSTRY LIMITED. As the Top-10 professional manufacturer of floor springs ( floor hinges) in China, Lasting Hardware Door Control Manufacturing Co., Ltd. keeps on providing the best quality products with reasonable prices in door control industry. 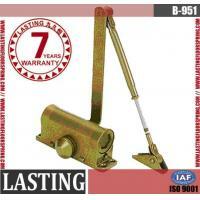 We are specializing in floor springs ( floor hinges) , door closers and patch fittings. Our brand " LASTING " is well known in China and our company has the sales network of 50 agents. OEM orders are welcome and overseas agents are wanted. Our factory is located in Foshan, China. With more than 10 years of experience of marketing and manufacturing in China, we are dedicated to widening our markets in the world. Our 300 staff members and 50 sets of TAIWAN professional computer-controlled machines are ready to supply you with very good products and services. Welcome to our factory to audit. Please feel free to contact us or click on our website.